The first paper from Invest in ME-funded research has been published. This B-cell study was recommended by Invest in ME Research Advisor, Professor Jonathan Edwards, as part of the preliminary lab work prior to a UK clinical trial of B-cell depletion therapy (rituximab). It is an important step towards implementing the charity’s strategy of biomedical research and establishing a Centre of Excellence for ME research and treatment. An achievement that could not have happened without great supporters finding innovative ways to crowdfund, often with very limited physical and cognitive function – so thank you to everyone who has helped us get this far. ‘Extended B cell phenotype in patients with myalgic encephalomyelitis/chronic fatigue syndrome: a cross-sectional study’ has been published in an early view of the journal Clinical & Experimental Immunology. Preview link – here. An abstract – here. “This is the first study in ME that used extended B cell surface markers and they tentatively found subgroups on the basis of B cell phenotype and illness duration. This work continues and is being done in close collaboration with the Norwegian researchers (in line with IiME’s ethos of international collaboration in research) to make the best use of resources and patient benefit. 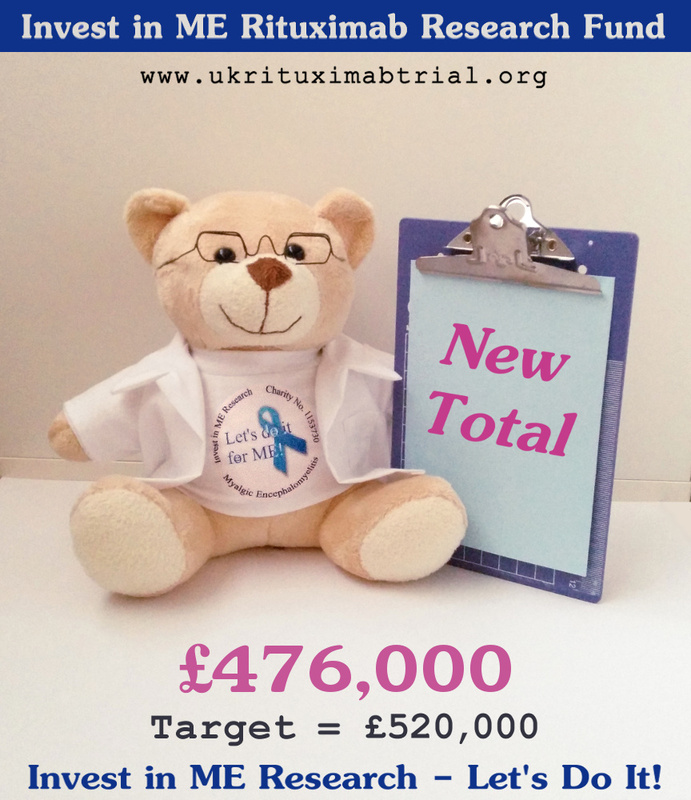 The latest news on the IiME-funded B-cell research and upcoming rituximab clinical trial is added to its dedicated website ukrituximabtrial.org then shared on our UK rituximab trial Facebook page before being shared on our social media sites more widely. Follow us on Facebook and Twitter to stay in touch. You may also wish to subscribe to our blog by email. The amount raised for this research sits at £476,000 and our current goal is £520,000. Fundraising is still very much on-going and much needed. We hope the progress being made will help spread awareness of this research and inspire more fundraising events – do you know a willing wellie (well person) who is looking for a charity to support in an upcoming sponsored event? Let them know about us and how much fundraising for Invest in ME would mean to you. Small one-off donations can be made quickly and simply by friends and family via text. You may wish to choose how you give to this research from the full range of options, including a monthly donation option, on the trial site here. Help us March on A Million and kick-start biomedical research into ME. You can browse our recent event blog posts here. If you’d like to contribute a blog post contact us.